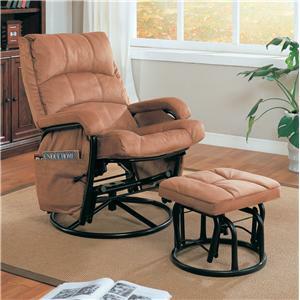 This glider recliner with matching ottoman instantly makes any room in your home more inviting. 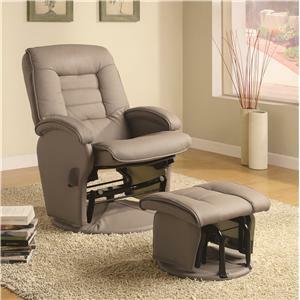 A plush padded back and pillow arms invites you to sit back and recline in style. 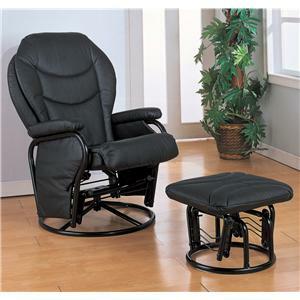 The matching ottoman offers the same plush seat and gliding functionality of the chair. A hanging bag keeps magazines, books, remotes and eyeglasses close at hand for added convenience. 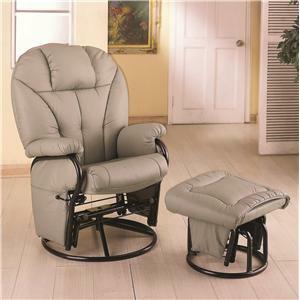 Your choice of black or beige leatherette lets you choose an upholstery finish that blends seamlessly with your decor. 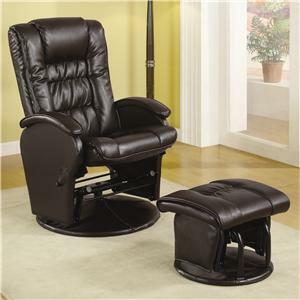 The Recliners with Ottomans Casual Leatherette Glider Recliner with Matching Ottoman by Coaster is available in the area from FMG - Local Home Furnishing. 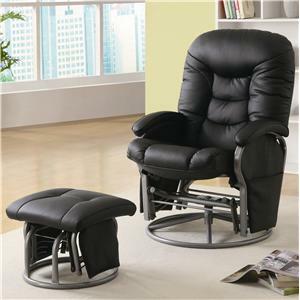 Relax your way to ultimate comfort with this versatile collection of recliner with ottoman sets. Coordinating ottomans make each recliner, glider or combination chair a perfect fit for your living room, media room or den. Side pockets on select seats provide convenient storage for remotes, books, magazines and more. 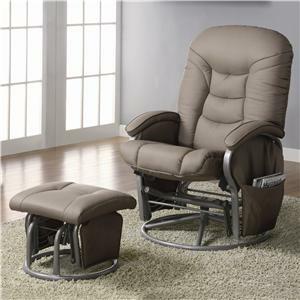 A wide range of fabrics and finishes even let you choose the chair and ottoman set that suits your tastes. Place in your living room or den for plush comfort from dawn to dusk, tuck into a corner with a floor lamp for an ultra cozy reading nook or group with your love seat and sofa for a stylish accent to existing decor. 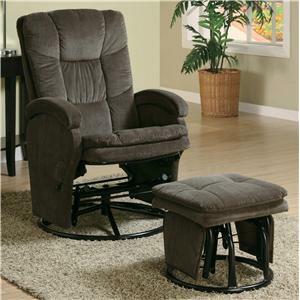 Regardless of where or how you use them, these fantastic recliner and ottoman sets are sure to bring distinctive style and unsurpassed comfort into your home! 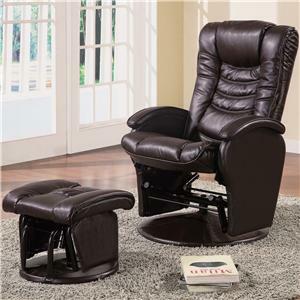 The Recliners with Ottomans collection is a great option if you are looking for Casual furniture in the area. 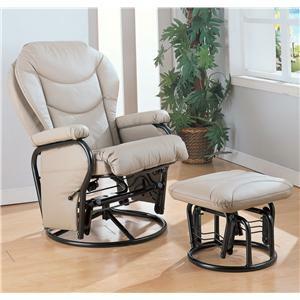 Browse other items in the Recliners with Ottomans collection from FMG - Local Home Furnishing in the area.